West New York, N.J. – August 19, 2016. Mayor Felix E. Roque, M.D. 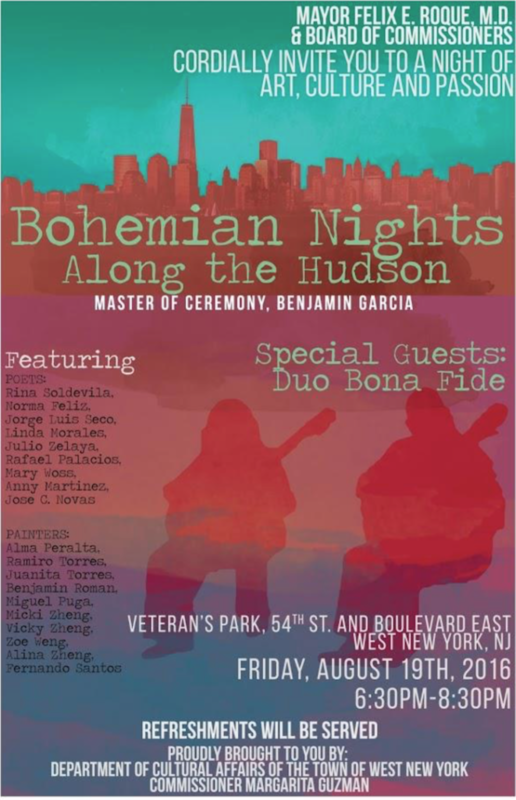 and the West New York Board of Commissioners cordially invite you to the first ever “Bohemian Nights along the Hudson”. The event will showcase a medley of poets, painters, and musical performances for your relaxing Friday afternoon pleasure. Join us on Friday, August 19th, 2016 at Veterans Park from 6:30- 8:30 P.M. for a night of art, culture and passion in the magnificent backdrop of the NYC skyline. Refreshments will be served.